Rhett with wife Molly and trusty dog Moxi. Rhett Nemelka comes from a long line of attorneys and police officers. His grandfather was a police officer in Salt Lake City for most of his life. His father, Richard S. Nemelka, has been practicing law in Salt Lake City for the past 33 years. Both of his brothers are practicing law as well. 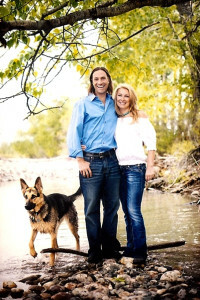 The Nemelka family has had a long line of legal professionals including a Salt Lake County Attorney, a Summit City Attorney, and several police officers. Rhett has kept the family tradition alive and established his family’s love for the law in Montana. He spent several years working with his father as a paralegal, process server, and legal assistant while attending the University of Utah. In addition, he was licensed Real Estate Agent for Mansell & Associates in Salt Lake City. For the past 20 years Rhett has been involved in all aspects of the law with a focus on helping the “little guy” in all types of matters. Once established in Montana, Rhett had the unique honor to work with Judge Mike Salvagni, District Court Judge in Gallatin County where he discovered that there was always another perspective to every legal matter; the Judge’s. With his blood line and his non-traditional view on legal matters, Rhett has become a valuable asset to Nemelka & Restum P.C.